JMT part 2: In which we learn to yell BEAR! It was good our first day on the trail wasn’t ambitious because it took us forever to get out of the campground at Bridalveil Creek. Dad cooked some delicious griddle scones (seriously: scones, on a camp stove!) and then everyone shuffled to start packing. Mom, in particular, clearly had not finalized the contents of her pack and was having trouble fitting everything in the small, lightweight Osprey she had bought for this trip. Somehow, even though we were only carrying four days of food, we still needed 6 bear canisters, the voluminous plastic buckets with screw-on lids that keep bears from our food. I felt kind of like we were a circus train leaving camp, with overstuffed packs and things dangling off the sides. Dad had a travel luggage scale with him ("That's why your packs's so heavy!"). My pack weighed in at 45.2 lbs the first day. Lightweight backpackers we were not, but I accepted it as a challenge. 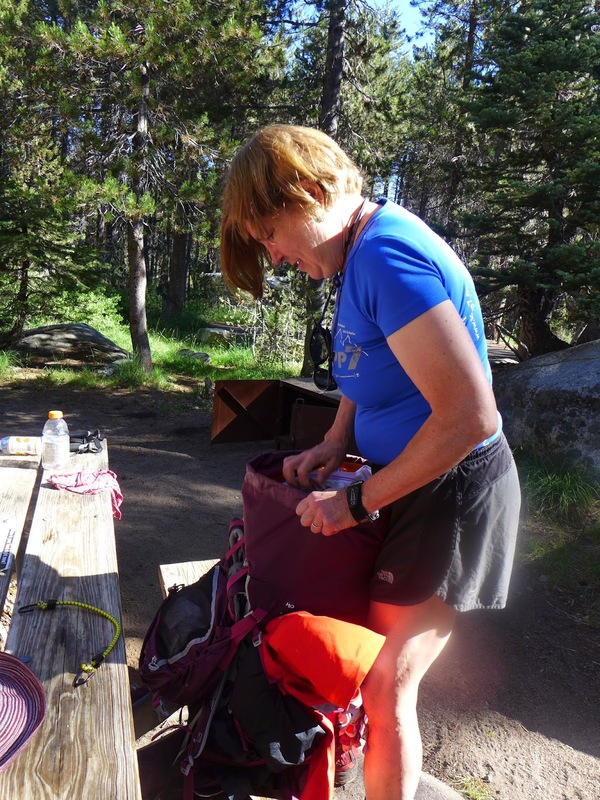 I have always felt encumbered by heavy loads, and was relishing the opportunity to get used to carrying a big pack. We trudged up the road to Mono Meadows trail head, and then down to Illiouette Creek the same way Dad and I had on our day hike the previous day. It was a short, but beautiful hike through the lush Mono Meadows and a classic Yosemite burn. It felt further with the big pack though, and I was looking forward to a dip in the creek. Near the creek was World’s Most Perfect Campsite. A sandy, partially shaded area right by a delectable swimming hole. We pitched our tents in the early afternoon and we all waded into the swimming hole, marvelling at the clear, cool water. It was perfect, the kind of Sierra beauty I expected when I first imagined the trip all the way back in October. After that we lay in the shade, reading, writing, napping, savouring the luxury of having nowhere to be, nothing we had to do. Pennie arrived a few hours later after driving the van, White Thunder, around to Tuolumne Meadows, taking a bus back to the Valley and then hiking up to Mono Meadows via Glacier Point. She was elated from her hot but beautiful hike. 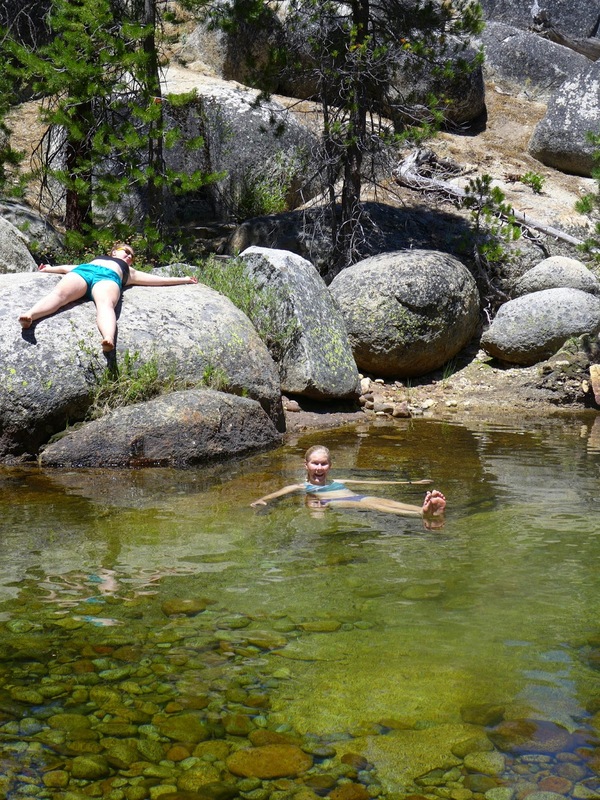 The campsite, the weather, the swimming hole - it all felt like an afternoon in paradise. It turns out paradise is finite. I woke up a 5:30, just beginning to conform to the ‘thru-hiker’ time zone, means going to sleep and getting up in sync with the sun. Sunset was just past 8:00 pm for most of our hike, and sitting around in the dark, especially because campfires weren’t allowed at many of the sites, wasn’t appealing. Before the hike, Dad created a huge spreadsheet of food, with calorie counts and suggested meals. A lot of our food was purchased in bulk, like freeze-dried carrots, which makes sense when you’re travelling with a big group, so that we cooked whole meals out of freeze-dried ingredients. Among the breakfast meals was something called ‘smoothie breakfast’. Reading this line of the spreadsheet before the trip, I remembered imagining the smoothies I make a home, thick and full of fruit fibers. This morning, Dad had whipped out the smoothie mix. It was a sickly pink powder with some freeze dried chunks of fruit. He invented a smoothie dance to mix it in a large plastic water bottle, hopping from one foot to the other and shaking in a sick parody of a Native American Shaman. Humor degrades so quickly on the trail. We finally start hiking at 8:15 am, and split into two groups. Pennie and Mom took the most direct path to Nevada Falls, where our path would officially cross the JMT. The rest of us took the longer Panorama Trail around. As we climbed up towards Glacier Point, my pack felt heavy and all wrong. There was too much pressure on my collarbone, as opposed evenly distributing the weight across my shoulders, back and hips. I stopped to try and shorten the back plate even more, which helped a little, but I still felt like the pack was suspended too far off my back rather than curving around it. I started to feel frustrated. It was only our second day on the trail and I felt totally out of shape. All of my training didn’t seem like it translated to backpacking at all - my heavy, uncomfortable pack was ruining everything! I sang to make myself feel better. Singing works every time, and by the time we reach the top to Illiouette Falls to a spectacular view of Yosemite Valley, I have mollified myself. How heavy our packs do grow. On the good old JMT. On the way to Mt. Whitney. The Panorama Trail lived up to its name, with sweeping views the hulking granite domes scattered above the Valley. We arrived at Nevada Falls for the second day in a row, rendez-vousing with Mom and Pennie a little past noon. It was hot again, and again many of us submerged ourselves in the cool river. As we ate lunch in the shade of a tree, we count the tortillas and somehow the number is off - we didn’t have as many tortillas as we were supposed to. This made me grumpy. I didn’t come here to starve, and besides, what was the huge food spreadsheet for? We were also low on our granola/energy bar count. One tortilla slathered in peanut butter and some trail mix later I felt better, but the rest of the group now viewed me as some sort of food ogre. I joked that I had to work on my Hanger Management. (Seriously though, I do). We finally shouldered our packs again to leave Nevada Falls during the hottest part of the day. 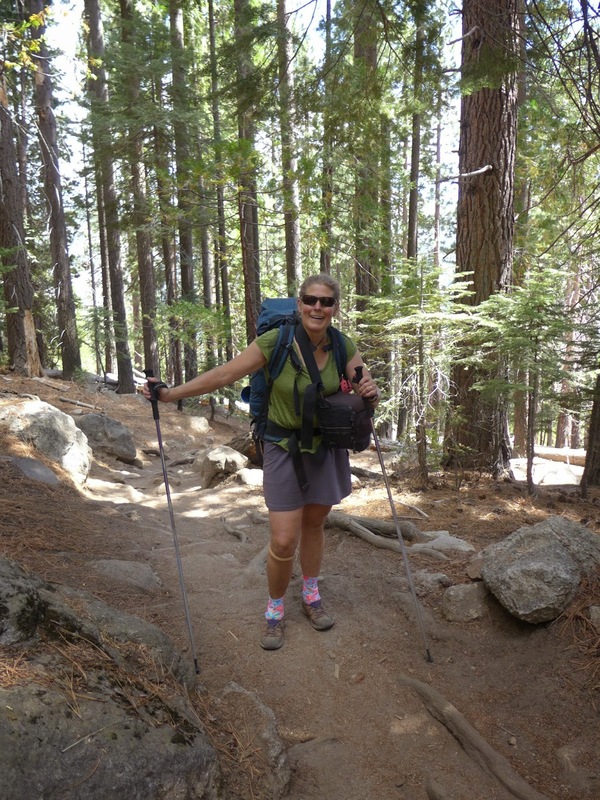 The dusty trail zigzagged through Little Yosemite Valley, and I felt progressively worse, as thought the peanut butter I ate was in fact oozing through the soles of my shoes and gluing me to the trail. The sun was relentless, and I felt dizzy. The last mile and half from Little Yosemite Valley to the Sunrise Creek junction were possibly the longest of my life. As twilight started to creep through the trees, a woman in beige pants and a vest with a very official looking walkie-talkie showed up. It turned out she was part of a bear management squad. “There tends to be a lot of bears in these campsites,” she informed us in a rapid, excited tone. And they were planning to capture and tag a bear, that very night! “So if you hear anything that sounds like a bear,” she said, “Just yell BEAR and we’ll come a capture it!” She also told us that bears would eat anything scented - it all had to go in the bear canisters. Apparently there is a bear in the Valley that eats citronella candles. This prompted a flurry of us running around, yelling things like, “Is Ibuprofen scented?” and cramming things into bear canisters. The bear squad lady left us very much ruffled, excited and maybe a little scared about the prospect of seeing a bear. I woke up during the night, and every crackling twig was a bear in my mind. Unfortunately, none of these visitors were real. The 2nd and 3rd days of each backpacking trip are worst for me. I haven't read part 3 yet, but I bet you found your hiking legs. Excellent post, I especially loved the part about the peanut butter gluing your feet to the ground.